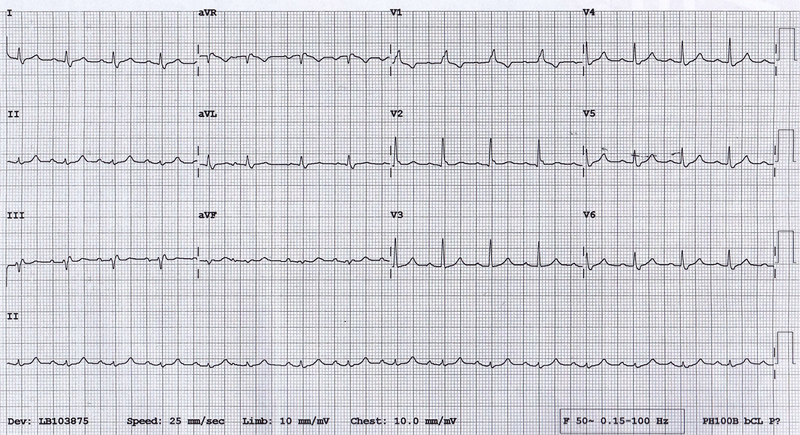 an 81 year old male is referred by his GP for ongoing tachycardia & progressive hypotension. He has been gradually taken off his antihypertensives (telmisartan & prazosin) over the past 2-3 weeks as his BP has consistently been 80-90mmHg systolic. P-wave axis appears normal . Low voltage QRS, no electrical alternans. Narrow complex regular tachycardia with incomplete right bundle branch block. The differential diagnoses in this instance is broad. How can we narrow this down further ?? 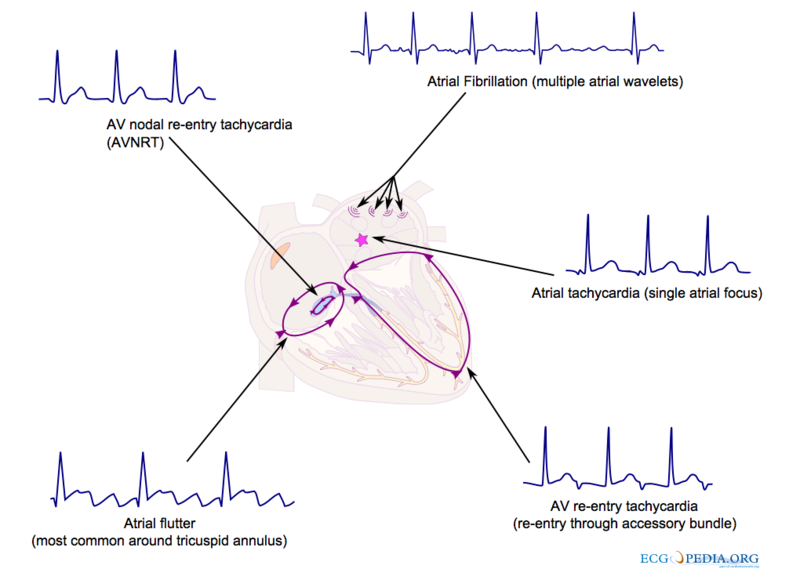 Firstly a reminder of the electrocardiographic anatomy of supraventricular tachycardias…. Electrophysiology of supraventricular dysrhythmias. Image courtesy of ECGpedia. This additional assessment of the P:QRS relationship assists in differentiating “supraventricular tachycardias”. Short RP = P wave immediately follows the QRS. Long RP = an interval P wave precedes the QRS. Alternatively; if the RP > PR it is a long RP interval. Differential Dx of Short RP-interval SVT. Reentry pattern seen in Typical AVNRT. Note the “short RP interval”. Image courtesy of ECGpedia. Differential Dx of Long RP-interval SVT. Vertical blue lines indicating P-waves. Note that the RP interval is > 50% of the RR interval. We are dealing with a long RP-interval tachycardia. Now, let us look at the P waves !! P waves – negative in aVR; positive in II/aVF. The P-wave axis appears ‘normal’; ie. heading in a superior to inferior direction, suggesting that the P-wave is originating near the SA-node. This makes both atypical AVNRT & AVRT very unlikely & hence narrows down our list of differential diagnoses to sinus tachycardia, sinoatrial nodal reentry or atrial tachycardia (with a high right-atrial focus). What is your approach to this patient ? An elderly patient with tachycardia, hypotension and low-voltage on ECG. Must consider & investigate for pericardial effusion. In this instance, bedside ECHO showed no pericardial fluid. Over the initial 45 minutes of evaluation in the ED, the heart did not halter from 125-130 bpm. This was despite IV fluid boluses for hypotension & analgesia. This increased the suspicion of an atrial tachycardia or SA-nodal reentry. We consider the idea of slowing the AV-node to see if we can get some more answer, however with ongoing hypotension we are loathed to try medications. After a quick listen to the neck for a bruit, we gave a trial run of carotid sinus massage. A small pause… (no flutter waves) – not captured on paper, sorry. 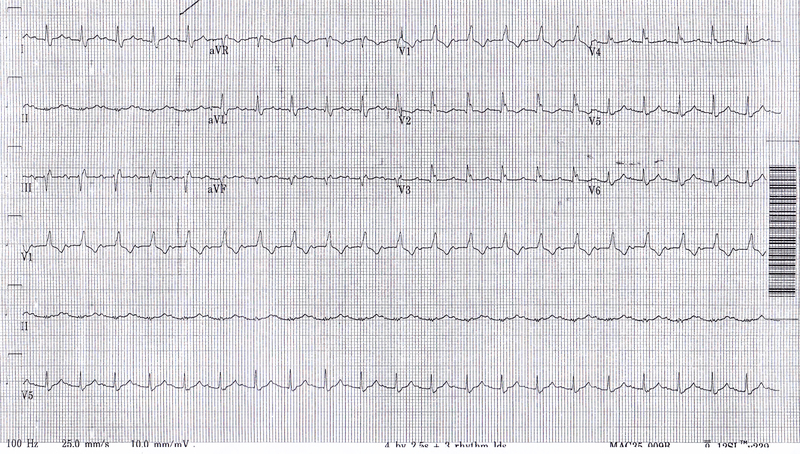 I believe the initial ECG is an atrial tachycardia that reverted with carotid sinus massage. Responsible for only ~10% paroxysmal SVTs. Typically results from a single ectopic atrial pacemaker (triggered by digoxin toxicity or increased automaticity) or reentry of the atrial tissue. Occurs in people with normal hearts & those who structurally abnormal hearts (eg. congenital heart disease or valvular heart surgery). Reentrant forms [micro-reentry] may be continuous & sustained. Tachycardia – rapid & regular. Tachycardia gradually speeds-up over time. Dyspnoea, dizziness, fatigue, chest tightness. Especially in those with tachycardia-induced cardiomyopathy [frequent, incessant tachycardia]. As with all dysrhythmias; ensure the patient is not anaemic & that there are no electrolyte disturbances. Caution with negatively inotropic agents (esp. verapamil) → Can result in profound cardiovascular collapse ! Consider ultra-short acting agents such as esmolol or adenosine; Typically adenosine will not, but can revert atrial tachycardia – instead allowing you to see the ongoing P-waves march through. May not be successful in incessant forms (or with MAT). Verapamil seems adequate at controlling atrial tachycardia from triggered activity. Whilst beta-blockers are recommended for AT from enhanced automaticity, their overall success rates are low. Class III antiarrhythmics can be used to maintain sinus rhythm. However most patients should be able to be discharged if systemically well. Wellens HJ. The value of the ECG in the diagnosis of supraventricular tachycardias. Eur Heart J. 1996 Jul;17 Suppl C:10-20. Determinants of “P” wave location in narrow qrs tachycardia ? @ Dr.S.Venkatesan MD. Interesting indeed. It almost looks as if there is an extra P wave embedded within each R-R interval of the tachycardia rather than a long RP (or PR) …. Would have been so nice to have a running strip when the rate slowed. Atrial activity challenging for me to assess during the tachycardia … – but fairly abrupt conversion post vagal maneuver supports some form of reentrant mechanism. Wondering in the “retrospectoscope” about use of low dose Adenosine as diagnostic/therapeutic trial – BUT – All is well that ends well – NICE case and NICELY presented! To be honest, I wasn’t expecting such an abrupt result to the vagal manoeuvre ! Next time, I’ll be capturing the move on tape for sure….